One of my favorite things to eat when I go on my ramen runs is really good chashu. The places close to me don’t do the chashu as tender as I’d like so I decided, per usual, to make my own. To me, charshu should be extremely tender with a nice crispy outside. Or maybe I’m just looking for something to fulfill my porchetta cravings at the same time. 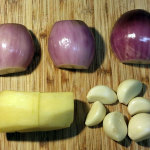 After searching the internet for recipes, I narrowed down to this recipe. Lay out the pork belly, skin side down, and season with pepper. 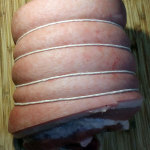 Roll the belly into a cylinder and secure it with cooking twine. It doesn’t have to be perfect, just make sure it’s still in a cylinder when you’re done. I’ve seen this happen in several ways. 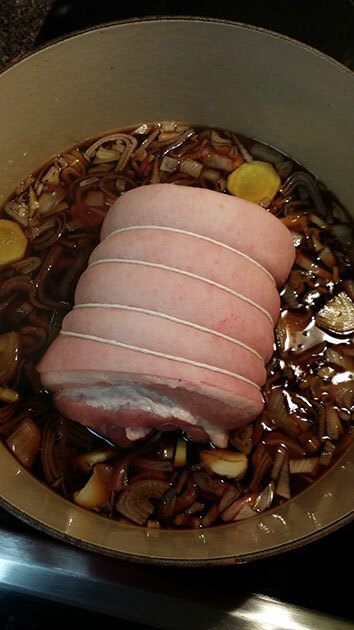 For beginners, cut 4 pieces of twine that measure out to 10″ each and tie each one around the pork. In a slow cooker on low heat, add all the ingredients including the wrapped pork belly. Cook for 6 hours and remember to turn it every hour. 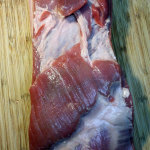 Remove pork and let cool before cutting. DO NOT REMOVE THE TWINE. When you’re ready to serve, slice of pieces as you need them. Finish off the pork by blowtorching the skin to make it crispy. You do not have to reheat the pork if you’re going to throw this in a noodle dish. The better the ingredients, the better it will taste. For this recipe, ask the butcher for the leaner cuts of meats. Keep the broth. It’s delicious. Don’t waste it. Recommendations out there say to make soft boiled eggs with it. It will color the egg and look like the eggs you see served in ramen. When are you going to do something on a vegetarian option.. What ever happened to meatless Mondays!! !